ChooseWhat.com helps guide entrepreneurs through the process of starting a business. Small businesses make up about 99% of all employer firms in the US. Many budding entrepreneurs have no doubt been scared off from turning their great ideas into an actual company because they think starting a business is too daunting and hard. While starting a company does require a lot of hard work, the barriers of entry are lower than ever. The Internet has made it possible for small businesses to access tools that were once only available to companies with a lot of money. The wider availability of new services has now drastically reduced the cost of performing standard business tasks such as setting up phone systems, using marketing tools, or backing up data. The biggest challenge is not simply getting a tool, but deciding what to choose. ChooseWhat.com has a team of motivated individuals just like you researching, testing, and reviewing the latest business infrastructure tools to help you get your business off the ground without breaking the bank or wasting your time. We guide you through every step of the startup process, from naming your business to hiring your first employee, and beyond. Along the way, we’ll give you our recommendations based on personal experience, thorough product testing, and your particular startup needs. Let us do the research while you make the decisions. ChooseWhat.com’s founder Leo Welder has directly experienced many of the problems they aspire to solve for other small business owners. ChooseWhat.com's first business products review category, FaxCompare.com, was created because Leo wasted an exorbitant amount of time selecting an online fax service, only to find after purchasing it that it was incompatible with the company's needs. 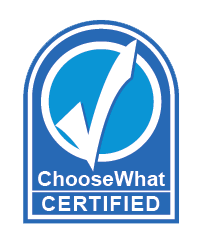 Now, ChooseWhat.com helps other small business owners and entrepreneurs avoid the same problem by presenting all of the relevant information you need to make informed decisions on the right tools and products for your business. 2. Provide our visitors with enough information to make an informed buying decision in a short amount of time. When we create a new comparison and review category of business tools, we begin by researching some of the more prominent providers of a specific service. For email marketing services, this might include companies like Constant Contact and iContact. We then compile information about their pricing, features, and any other information that a buyer should consider when evaluating the service/product. We test as much as we can about the services to see how they perform - this includes the products themselves and all customer service channels. ChooseWhat.com identifies what a buyer really wants to know when choosing a product or service and communicates it to you in language free from industry jargon that anyone can easily understand. Most importantly, we let our research dictate the outcome of our reviews. 1. We typically only get paid if you actually sign up for the service. 2. As with most referral programs, you must not cancel the service or return the product before the expiration of an initial period (typically 30 to 45 days). If we were to misrepresent a product or service, you would likely cancel or request a refund, and we'd all lose. 3. We need to earn your loyalty, so you'll continue to come to us for advice. If you think we've misled you, we doubt you'd return. We wouldn't. In an effort to provide a complete comparison resource, we review all of the relevant companies we are aware of within a products category, regardless of whether they offer a referral program. Our visitors deserve an apples to apples comparison of all the providers in a certain segment, not just the ones with which we have a referral agreement. "I received this link from Austin Young Chamber of Commerce and I was blown away by the quality and concise delivery of your advice. I liked you on Facebook, but I just wanted to take a minute to say 'Hurray!' I have been looking at a lot of these sites as I start my own company, but this is by far my favorite. I will definitely spread the word! Congratulations on a well-made website!"